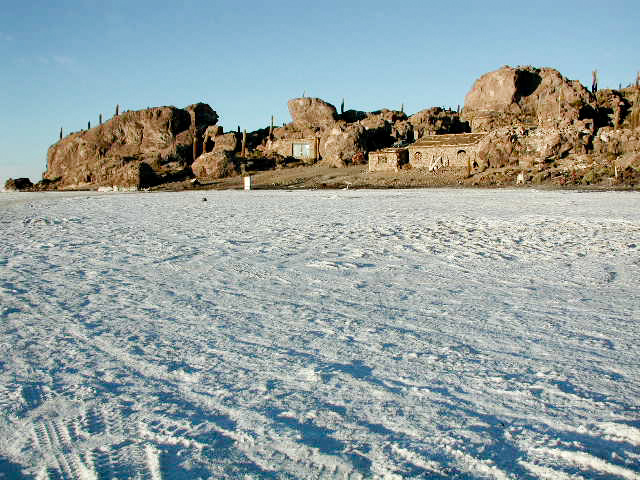 The tour starts in Colcachi, a city by the salar in which the main activity is salt extraction. We saw the salt process, the withdrawal, the drying and the wrapping up. Later we visit the salt hotels. They are all constructed with salt blocks: walls, chairs, beds. When we went back to the car, it didn’t start. We had that to push it. We drove to “Isla Pescado”, the original name was Inca Huasi, that means ¨House of the Incas¨. There I decided to stay for the night. In the island, the only inhabitants are a couple that takes care of the place. I slept in a room offered by them. I had gotten a permit by the Turist office to sleep and photograph the island. Next day I continued the tour with my group. We went back to Uyuni to get a 4 wheel drive car. Next stop was San Cristobal, a small village where we slept. I wanted to do a 3-day trekking in the Colca Canyon. Since the area was in alert of another possible earthquake, any travel agency wanted to organize a tour there. I talked to a local guide, he suggested me not to go down the canyon, that could be very dangerous at this time. I decided then to do a two-day tour in the canyon. In the city exit we already could see the volcanoes: Mist (means gentleman), Chachani (means well dressed, referring to its snow top) and Pichu Pichu (means peak). In the way we stopped to see Vicuñas (a wild relative of the llamas) in the Reserva Nacional de Salinas y Aguada Blanca. An hour later we stopped to have a coca leaf tea to go through the highest point of the tour. By noon I left Baños (1800m) to Riobamba(2800m). At 2 o’clock I got in town and arranged a tour to see the volcano Chimborazo, the highest mountain in Ecuador. They say it is the furthest point from the center of the Earth. This time there was a Dutch couple, a guide, a driver and me. My expectations were very low since the day was cloudy and I had stayed a week in Baños trying to see the top of Tungurahua, what I couldn’t because of the clouds. As we begin to go up, the sky seamed to clear. We started to see a little of the mountain, sudently it was there, the white top of Chimborazo. It was beautiful, as if we had gone higher than the clouds, as if we were looking from the top. The happiness was general, the Dutch couple was also frustrated for not being able to see the Tungurahua. On the way to the refuge we saw some llamas and vicuñas. Baños, a small town south of Quito, attracted me as I got off the bus and could see the mountains surrounded it. 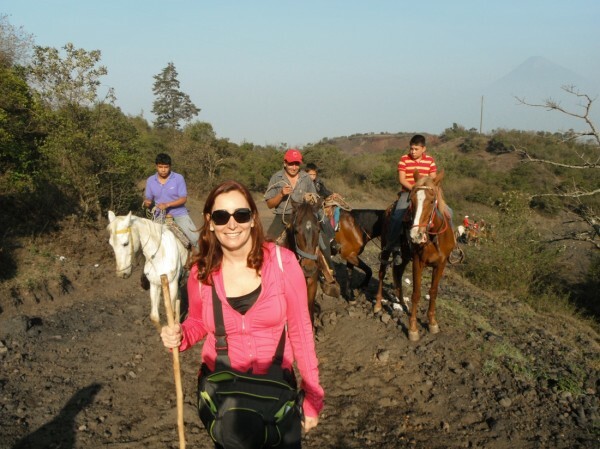 With a population of less than 20.000 inhabitants, the city is located in the botton of the Tungurahua volcano. It is active and has probabilities of erupting any time. In 1999 the city was evacuated for being considered dangerous. As the volcano didn’t erupted, the inhabitants came back even though the it is still active. The population complain that their things were stolen when they were away. They even distrust the police that made them leave. Again, I went to see the open market in Otavalo. From there I decided to visit the Cuicocha lake. I caught a bus up to a small town called Cotacachi; from there I got a taxi to Cuicocha. The name of the lake is due to the fact that in the region there is a lot of “cui”. 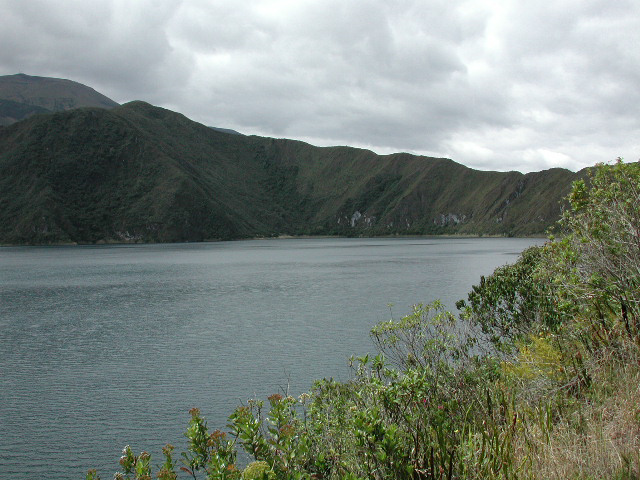 Cui means guinea pig and cocha, lake in Quechua. At an altitude of 3070 meters and a depth of 180m, the lake was formed in the crater of a volcanic eruption. It stored water in its interior and has an island in the middle. I did a boat tour to go around the island. It didn’t take long but it was worthwhile to see the wall of the volcano from inside. I could see water bubbles from gases that come up from the depths. The color of the water, sometimes dark blue, other dark green, makes the landscape to be a good excuse do go all the way there. It gives a great peaceful feeling. I woke up early to go to the Cotopaxi Volcano. This made me feel a little bit anxious. I had been in an altitude of 2800m above see level for only two days and in two hours I would go up to a height of 4800m. I’ve never had been to an altitude like that before. I went with a driver and two English guys, a tour arranged by a hotel. To get there was easy, as we left early we did not catch too much traffic. At 3800m of altitude there was a museum that shows to the visitors a little of the volcano history. At 4500m we stop in a sort of parking lot. There we got off the car and had to walk to the refuge (at 4800m). 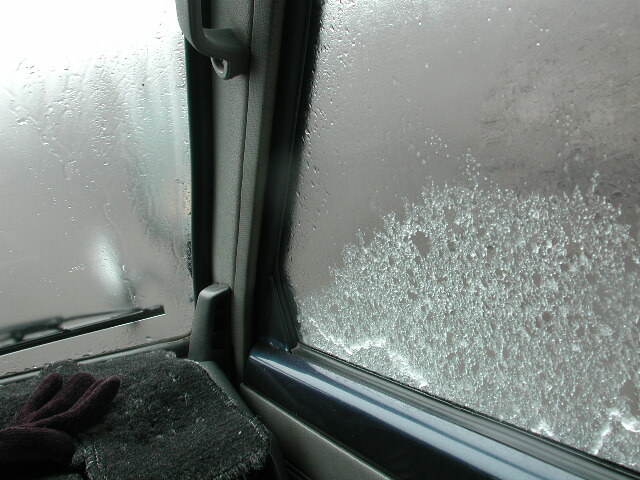 It was very cold, the wind was strong and snow falling. The way up was steep and slippery (it reminded me the volcanoes in Indonesia). After the first the 20 steps I was already tired, I had to stop. My heart was beating very strongly, for the first time I felt the effects of the thin air.